Lillian Annette Salmi, 91, Cloquet, passed peacefully, surrounded by loved ones, May 23, 2018 at St. Lukes Hospital. 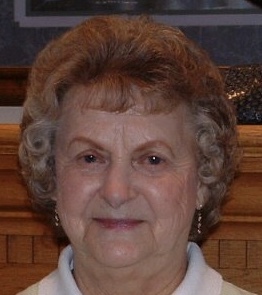 Lillian was born April 30, 1927 in Grey Eagle, MN to Arthur and Bertha (Robbins) Graber. She married Paul Salmi on November 22, 1947 and together, they had nine children. Lillian had a passion for gardening. You would often find her tending to her various flowers and plants, including her favorite, the African Violet. She was also an avid bowler, winning many league trophies. Although she enjoyed bowling, it was the friendships she made that she cherished the most, including meeting her later-in-life love Don Erickson at the bowling alley. Although they never married, the years they were together were some of the happiest of her life, until his passing in 2015. Lillian had a love for music and for baking; often singing in the kitchen as she made her kids their favorites. Her various breads, and “page 258” will be forever missed. She was preceded in death by her husband, Paul; special friend Don Erickson; sisters Pearl Messenger, and Nellie Mokros, and brothers Jessie, Myles, John and Giles Graber. Lillian will be forever remembered by her children, Karen, Roger (Linda), Mel, Sherry (Jeff) Nelson, Steve (Marva), Bob (Cindy), John (Dean Kinning), Gene (Angie), and Glo (John O’Neill); 13 grandchildren, including her beloved Tarah; 22 great-grandchildren; and sister Irma Rahn. There will be a gathering of family and friends at 10:00 a.m. followed by an 11:00 memorial service on June 1st at Journey Christian Church, Cloquet. A light lunch will follow. Arrangements by Souder-Handevidt Funeral & Cremation Service.